The following post addresses some "frequently asked questions" regarding Raphael studies. The first of these is the enduring mystery of Raphael's date of birth. The second issue is Raphael's exhumation, which also addresses the description of his tomb being moved in Dan Brown's Angel's & Demons. In his 2003 publication collating primary sources relevant to Raphael, Professor John Shearman makes the sobering observation, "The archival system in Urbino is favorable to the survival of contracts and testaments, but not that of records of births or baptisms." Subsequently, we do not have a record of Raphael's birth or baptism. The ensuing debate around his date of birth revolves around later sources, commencing from the year of his death, and in both the 1550 and 1568/9 editions of Vasari. i. Diarii of Marcantonio Michiel. Morse a hore 3 di notte di Venerdi Santo venendo il Sabato, giorno della sua Natività. He died on Holy Friday at night at three hours, with the coming Saturday being the day of his birth. ii. Letter from Marcantonio Michiel in Rome to Antonio di Marsilio in Venice. ...morte rapito nel suo istesso giorno natale. ...death carried him off on the very day of his birth. The epitaph inscribed in marble besides Raphael's sarcophagus in the Pantheon, is variously attributed to either Pietro Bembo or Antonio Tebaldeo. Since the 1550 edition of Vasari, many texts cite this epitaph as being written by Pietro Bembo, although this is not conclusively known from extant documentary sources. QVO. DIE. NATVS. EST. EO. ESSE. DESIIT. RERVM. MAGNA PARENS ET MORIENTE MORI. AND DIED ON HIS BIRTHDAY, APRIL 6 1520. AND IN WHOSE DEATH DID FEAR HERSELF TO DIE. p.636. Nacque in Venerdi Santo a ore tre di notte. fini il corso della sua vita il giorno medesimo ch'e' nacque, che fu il Venerdi Santo. He ended the course of his life on the very day that he was born, which was Holy Friday. Raffaello d'anni 37, e nel medesimo dì che era nato mori. Raffaello 37 years of age, and he died on the same day that he was born. April 6/7 or March 28? The confusion over Raphael's date of birth hence comes down to the application of the correct date for Good Friday in 1483, which fell on March 28. This correction was not applied until later scholars noted Good Friday did not fall on April 6 in 1483. If we are to take the "Bembo" and Michiel records as the closest to the source, both of these seem to reference Good Friday in the present, namely April 6, 1520 with Raphael passing late into the night of that evening. Raphael's body did not lie in state for long, with records dated April 7 indicating his body had already been laid to rest in the Pantheon. Barring the discovery of new documentary evidence, we can not conclusively state Raphael's date of birth as either Friday March 28, 1483 or April 6 1483 (Old style reckoning). Moreover, particularly if Bembo was (as Vasari said) the author, he would know and surely have in mind the further coincidence that April 6 wa sthe date of both of Laura's epiphany to Petrarch and of her death (at the same hour)...This literary reference provides a motivation for mentioning Raphael's case in the epitaph, and tends again to a birth date of 6 April 1483. Petrarch's line in Trionfo della Morte referring to Laura's dates (and hours), L'ora prima era il di sesto d'aprile, drew Raphael's attention when constructing a sonnet [in 1509-10], and if 6 April had been his birth-date, it is easy to understand why. Although we may not be able to fully resolve the confusion around Raphael's date of birth, we can address a commonly asked question that comes from a scene in Dan Brown's Angels & Demons. The scene in question is excerpted below, showing Tom Hanks and his associate musing over when Raphael was buried in the Pantheon in Rome. A conveniently placed and fictitious sign near the tomb states that Raphael was moved to the Pantheon in 1759. 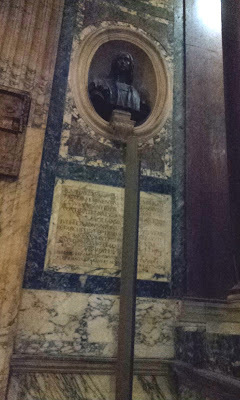 When asked to name where Raphael was originally buried, Tom Hanks is unable to answer - which is fortuitous, as Raphael was not buried anywhere prior to the Pantheon. Raphael's tomb was never moved, but was opened in 1833, when Pope Gregory XVI gave permission for Raphael's sarcophagus to be opened to verify if his body was in situ. This incident was memorialised in a painting by Francesco Diofebi in 1836. 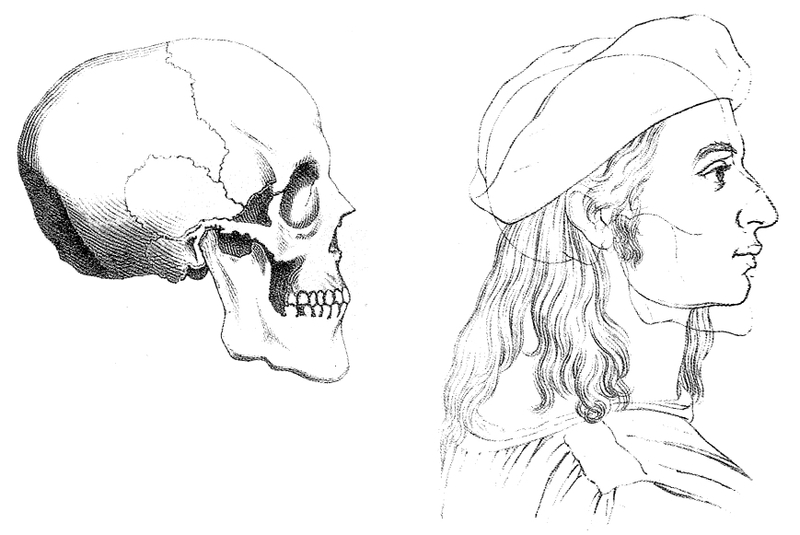 A cast was taken of the skull and a reconstruction drawing made based on its physical characteristics. Curiously, in 1883, a supplement to the Scientific American commented on the 1833 exhumation, and provided a drawing. The bones of Raphael are laid in this tomb since 1520, with an epitaph recording the esteem in which he was held by Popes Julius II. and Leo X.; but they have not always been allowed to lie undisturbed. On Sept. 14, 1833, the tomb was opened to inspect the mouldering skeleton, of which drawings were made, and are reproduced in two of our illustrations. The proceedings at the tomb in the recent anniversary visit were brief and simple; a number of laurel or floral wreaths were suspended there, one sent by the president and members of the Royal Academy of London; and the Syndic of Rome unveiled a bronze bust of Raphael, which had been placed in a niche at the side. Image from 1883 Scientific American Supplement depicting Raphael's bones as seen in 1833. The concern with Raphael's physiognomy peaked when his tomb in the Pantheon was opened in 1833. The skeleton was well preserved, and the skull, when measured was found to be consistent with the self portrait in School of Athens. Before Raphael's remains were reinterred, a cast was made of his skull...to celebrate the artist's 400th birthday (in 1883), the German anthropologist Hermann Schaaffhausen published a book on the subject. In 1884, anthropology professor Hermann Welcker published a commentary on Schaffhausen's findings. Superimposing an image of the skull with the profile image of the Altoviti portrait, he concluded that Raphael's skull was of a "radically different type." Unfortunately, Welcker's findings were themselves inconclusive, as the skull also did not exactly match the other known portraits. Of course, nineteenth century "craniometry" was not an exacting science, and we can only wonder what modern facial reconstruction experts could make from the cast..
As one wades deeper into the study of any given topic, the quirky and unusual are never far away. Although we may not be any closer to understanding Raphael's actual date of birth, we can prove that the nineteenth century obsession with Raphael resulted in the exhumation of his remains and anthropological study of his skull. This post is dedicated to Agnes Crawford for her kind assistance in Rome in 2012. Special thanks also to Dr. Edward Goldberg for the translations of the Michiel and Vasari sources. 2. Shearman, J. As cited above. Vol. 1. p. 572. Diarii source cited : Biblioteca Correr (Venice). MS Cicogna 2848. Diarii of Marcantonio Michiel. fol. 328.r. English translation by Dr. Edward Goldberg. 3. Shearman, J. As cited above. Vol. 1. p.581-583. Document source cited: Biblioteca Marciana (Venice) MS Ital. VII.256 (9243) fols. 245r-v. English translation by Dr. Edward Goldberg. 4. Shearman, J. As cited above. Vol. 1. p. 640-6. Describes the literature on the epitaph and the debate around its author. 5. Translation cited by Ames Lewis, F. In: The Intellectual Life of the Early Renaissance Artist. Yale University Press. p.106-7. The source of this translation is Bull's (1965/87) translation of Vasari. Vol. 1. p. 323. "VIII. ID. APRIL" is noted to be using the Roman calendrical system to denote April 6. 6-8. Shearman, J. As cited above. Vol. 1. p.48. English translations by Dr. Edward Goldberg. 9. Shearman. J. As cited above. Vol. 1. p.578. 7 April (1520) letter from Alfonso Paolucci in Rome to Alfonso d'Este in Ferrara indicates Raphael is already buried in the Pantheon. [...] Raphael de Urbino hozi si è sepulto a la Rotonda, et è morto de una febre continua et acuta, che già octo giorni l'assaltò." Source cited: Archivio di Stato, Archivio Segreto Estense (Modena), Cancelleria Ducale Estero. Ambasciatori, Roma. b.25 (170-VI-60). 12. Brown, DA. Raphael in America. National Gallery of Art Washington. 1983. pp.183-184. 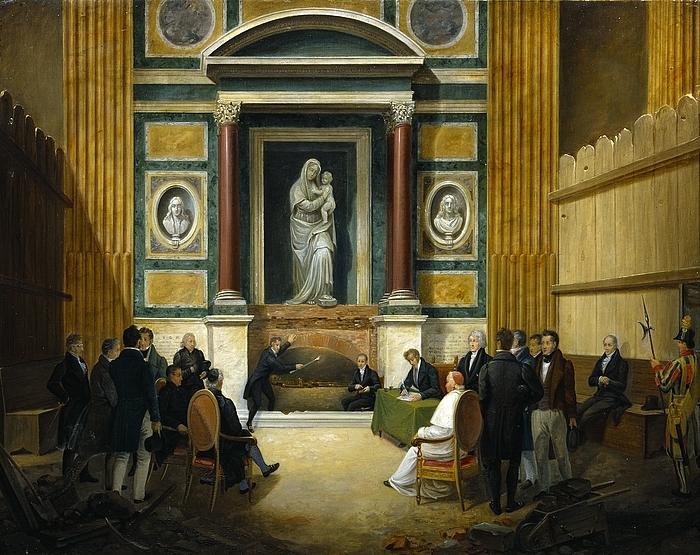 Describes the 1833 exhumation, and the cast made of the skull, which was further discussed by Hermann Schaaffhausen in De Schädel Raphaels: Zur 400 Jährigen Geburtstagsfeier Raphael Santi's. Bonn. 1883. *Angels & Demons (Sony Pictures 2009) clip excerpted under fair use guidelines (educational). I've always loved the story of Raphael's exhumation - thanks for this! Great post, Hasan! It seems a little bit curious that in the 19th century there was a need to verify that the artist's body was contained in the tomb. I wonder if the desire to draw the artist's skull and bones was actually the primary motivation for the exhumation? In your research, did you come across any other motivations for this project (like a discussion of tombs being shuffled or moved in the Pantheon at the time)? I appreciate your thorough research and resources - even down to the Dan Brown clip! Look at David Rijser's opening chapter of 'Raphael's Poetics' chapter 1 (2012) that deals with recently translated humanist epigrams attached to the tomb of Raphael after his death. @Alberti's Window - Great question!! I have updated the post (see note 14) with a little clarification. There was a another "Raphael" skull at the time - variously exhibited by the painter's guild - so they wanted to verify whether it was the real thing. Also, a sign that is sometimes seen in the Pantheon (which I admit I did not see when I was there in November) says the the Sarcophagus was checked to "verify the body's existence" - I do have a photo of it. From the readings, the skull seems to have been the main factor. Apparently Ingres requested a relic from the Pope when the tomb was opened, and received a small piece of rib. It's now in the Musee Ingres in Montauban, in a reliquery with plaques designed by Ingres (see Georges Vigne 'Ingres' p.122). Thanks very much for the link to Rowland's article. I love her 'Culture of the High Renaissance: Ancients and Moderns in Sixteenth Century Rome'.. an absolutely excellent account of the humanist body around the papal court. One can understand with her background knowledge she is able to make the connection with the Jewish / kabbalistic interests of Giles of Viterbo and Raphael's painting.Last year I read her biography on Giordano Bruno. Couldn't put it down! Loved it.